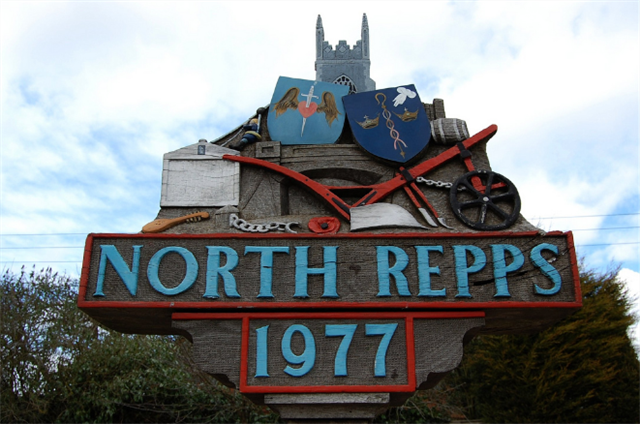 Northrepps is situated nearly three miles from Cromer and is probably the only village in north Norfolk to have an airportwhich is used by private light aircraft and enthusiasts of paragliding, microlight flying and model aircraft. The different types of houses, including some thatched add to the charm of the village. Northrepps Hall was the home of Sir Thomas Fowell-Buxton, who worked hard to achieve the abolition of slavery with his friend William Wilberforce. In the early part of the 19th century experiments on the famous 'breeches buoy' were carried out under the direction of Miss Anna Gurney, who by her enthusiasm in the pursuit of saving lives at sea won the respect of the local seamen. When Trinity House placed a lightship at Happisburgh following her recommendation, the seamen named it 'The Gurney Light'. Miss Gurney lived at nearby Northrepps Cottage, which is now a restaurant set in beautiful countryside. The church, dating from before 1066, was built to its present standard during the 12th to 15th centuries, and is dedicated to St Mary the Virgin. A beautiful rood screen donated by John Playford was removed at the time of the Reformation, stored in a nearby barn and restored to the church in 1911, but owing to its damaged condition it was not placed in its original position. The village pub takes its name from a foundry that used to be situated nearby, where in 1830 the Gallas plough was first developed. This was widely used until 1920. The plough appears on the church weathervane which was donated by a local craftsman, Mr John Golden, to commemorate the coronation of Queen Elizabeth II in 1953. A former wheelwright at the foundry, 'Old Summers', was the ring-leader of the local smugglers. They once tied the chief Preventive officer to a post whilst they disposed of their contraband. Everyone in the village turned a blind eye when questioned. An ally of the smugglers was Mrs Sally Bean, who lived in a cottage on Shucks Hill, still standing today. The cottage had a 20 mile view the countryside on the south side which enabled her to give warnings when the Preventive officers were about. In 1977 a village sign was erected to commemorate the Queen's Silver Jubilee, with no fewer than eleven symbols depicting aspects of village history: the church tower, two shields, St Mary the Virgin and St Benet's Abbey, a cittern, a barrel and post, fetters, a breeches buoy, a car radiator, a Gallas plough, a bridge and a poppy. The radiator is that of the Rolls-Royce Silver Ghost. Henry Royce stayed in the village while he was developing his famous car. The shield of St Benet's Abbey reminds us of William Rugg, born in Northrepps. He was the last Abbot before the dissolution of the monasteries in 1536 and was Bishop of Norwich from 1536 to 1550. The cittern, a lute-like instrument, reminds us of John Playford, born in 1623, who wrote A Booke of Newe Lessons for Cittern and Glitten. The bridge depicted is one of only two remaining of the original 17. You are looking for a small vial. Please bring your own pen and an extraction tool to remove the log.